Vitaminlab offers the most innovative testing on the market to identify deficiencies to maximizing performance in athletes, biohackers or you. Get down to the biochemistry of your body. Our innovative test measure your nutrient status for the last 6 months, all in a one time test. 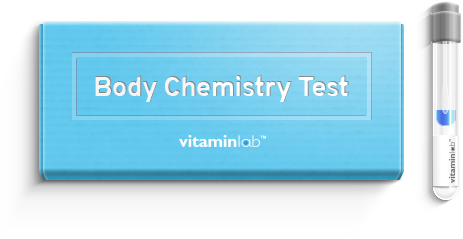 Our Body Chemistry Test gives you the most current functional analysis of nutrients and any nutrient deficiencies in your body. Unlike static blood tests, this is measured over the last 6 months. Our report asseses over 60+ biochemical markers, including vitamins, minerals, amino acids, anti-oxidants and fatty acids. Our team also uses the latest peer reviewed research to provide you with optimized recommendations (including correct dosage) based on your nutrient levels as well as medical history, lifestyle, diet and exercise. They also know what supplements to avoid based on potential conflicts with the vitamins and medications you’re currently taking. Chemistry Test and our biomarkers. below and we will contact you. Standard, Gluten-Free, Pregnancy & Lactation, Dairy-Free, and Vegetarian. Pathway Genomics’ team of registered dietitians are available to discuss each diet plan and determine the best caloric intake for you. Find out your current vitamin and mineral needs in your body to treat any deficiencies. Understand your heart health, oxidative stress and ability to fight infections and diseases. Know how well your body uses vitamins and minerals for energy and metabolism. Learn about your amino acid and protein status.